President Trump will attend but not speak at this week’s funeral service for former President George Bush, seemingly a compromise intended to respect tradition while avoiding an awkward moment given the animosity between the current president and the Bush family. Instead, eulogies will be delivered by former President George W. Bush, Mr. Bush’s son, and two friends, former Prime Minister Brian Mulroney of Canada and former Senator Alan Simpson, Republican of Wyoming. Rounding out the speakers will be Jon Meacham, the Pulitzer-winning historian and author of the definitive biography of the 41st president. Mr. Trump, who has been sharply critical of the Bush family in the past, has offered nothing but praise for the former president since his death at age 94 on Friday and made no complaint about being left off the roster of funeral speakers. “Looking forward to being with the Bush Family to pay my respects to President George H.W. Bush,” Mr. Trump wrote on Twitter on Monday. 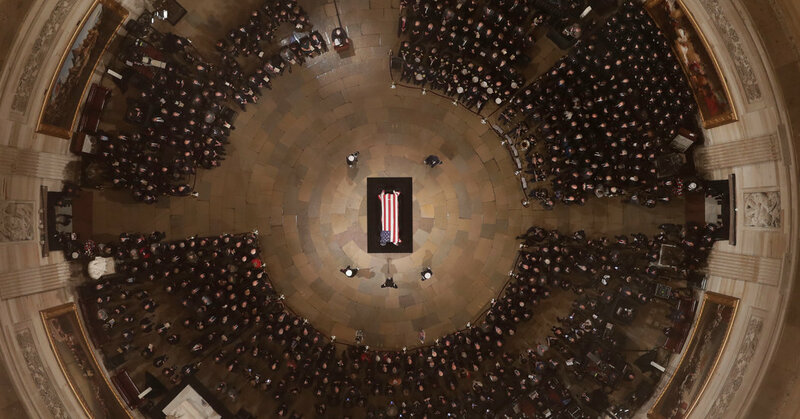 The lineup for the state funeral service at Washington National Cathedral on Wednesday emerged as Mr. Bush began his final trip to Washington, his coffin arriving at the Capitol on Monday evening. Despite the tension with the Bush family, Mr. Trump followed protocol by sending the blue-and-white presidential jet to pick up the coffin in Texas and bring it to Washington. Normally called Air Force One when the sitting president is onboard, it was given the call sign Special Air Mission 41 for the occasion. Friends and relatives then boarded the plane to join the Bush family patriarch for his journey to Washington, where he will lie in state before his funeral. Joining the family for the trip was the former president’s service dog, Sully, who was shown earlier lying by his coffin at the funeral home in a photograph released by Mr. Bush’s spokesman. The Bush family has been estranged from the incumbent president since the 2016 presidential election when Mr. Trump defeated former Gov. Jeb Bush of Florida for the Republican nomination in a bruising primary battle that turned increasingly nasty. Mr. Trump has also denigrated George W. Bush’s leadership, and on the campaign trail this fall, mocked the elder Mr. Bush’s slogan, “a thousand points of light,” referring to volunteerism. The elder Mr. Bush told the author Mark K. Updegrove that he voted for Hillary Clinton in the fall of 2016, and the younger Mr. Bush said he voted for none of the above. The 43rd president has at times issued barely veiled criticism of Mr. Trump’s nationalist “America First” approach to foreign policy and immigration. While Senator John McCain was dying this year, he made clear that he did not want Mr. Trump even to attend his service at the National Cathedral. Instead, he invited the two men who defeated him in his bids for the White House, the younger Mr. Bush and former President Barack Obama, to give eulogies. Their tributes to Mr. McCain in September were seen as implicit rebukes of Mr. Trump. The senator’s daughter, Meghan McCain, was even less elliptical in using her own eulogy to contrast her father with the president. “The America of John McCain has no need to be made great again because America was always great,” she said to applause. It would not be like Mr. Bush to want his funeral to be a spectacle, and he evidently chose not to defy protocol by asking Mr. Trump to keep away. While other presidents have at times skipped funerals for predecessors — Richard M. Nixon did not attend services for Harry S. Truman, with whom he had a difficult relationship — in recent decades it has been the norm. Even Mr. Nixon personally asked President Bill Clinton to deliver the eulogy at his service even though Mrs. Clinton, the first lady, had served on the House Judiciary Committee staff as it pursued impeachment during the Watergate investigation that led to his resignation. Mr. Clinton was generous in his testimonial. “May the day of judging President Nixon on anything less than his entire life and career come to a close,” he said in what was seen as closure over Watergate. Mr. Bush’s coffin was being flown on Monday to Joint Base Andrews outside Washington and will be taken to the United States Capitol, where he served four years as a member of the House in the 1960s. Congressional leaders plan a ceremony in the Capitol and he will then lie in state there until Wednesday morning before being brought to the cathedral. After the service there, Mr. Bush’s body will be flown back to Houston for a service at St. Martin’s Episcopal Church, where he was a longtime member. Former Secretary of State James A. Baker III, the president’s longtime friend, will speak at the church. The former president will then be taken by a special train named Locomotive 4141 and painted the same blue shade used on Air Force One to College Station, Tex., an echo of the funeral trains used for presidents like Abraham Lincoln, Franklin D. Roosevelt and Dwight D. Eisenhower. Mr. Bush will be interred on the grounds of the George Bush Presidential Library and Museum at Texas A&M University, laid to rest next to Barbara Bush, his wife of 73 years, who died in April, and Robin Bush, their daughter who died of leukemia in 1953 at age 3. Chronic wasting disease spreads in Wisconsin: Should humans be concerned? December 1, 2018 Comments Off on Chronic wasting disease spreads in Wisconsin: Should humans be concerned?